ESA’s Sentinel-2A satellite captured Lake Chad. 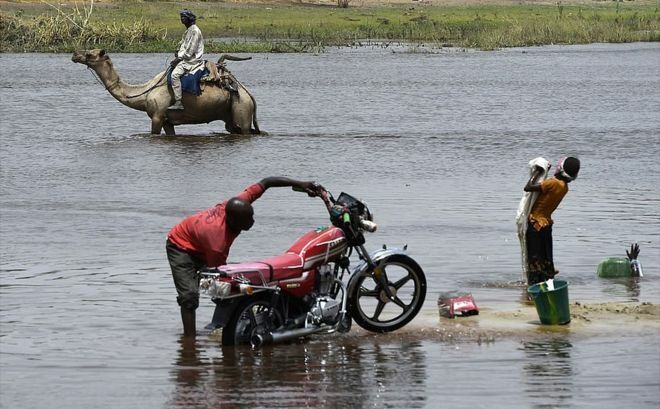 Once one of Africa’s largest lakes, Lake Chad has shrunk by around 90% since the 1960s. This receding water is down to a reduction of precipitation, induced by climate change, as well as development of modern irrigation systems for agriculture and the increasing human demand for freshwater. Lake Chad is economically important, providing water to more than 30 million people living in the four countries surrounding it (Chad, Cameroon, Niger, and Nigeria) on the edge of the Sahara.